Ferry operator Caledonian MacBrayne has reported that its staff have increasingly been dealing with aggressive passengers. In one incident, a man jumped up on to the counter at a ticket office while angrily complaining to CalMac workers about a sailing. Police were called and the man was found and arrested. In other incidents, staff on ferries and at ports have been verbally abused and threatened by drunk passengers. CalMac's director of safety, environment and security, Louis de Wolff, said: "Safety of our staff is a priority for us and recently we have seen a small upsurge of abusive passengers behaving in an intolerable way towards staff. This is unacceptable. "With people out and about socialising more over the festive period we felt this was a good time to reinforce the standards of behaviour we expect passengers to have towards our staff. "Good customer service is important for us and we are always striving to improve the way we deal with passengers, but in return we expect the same levels of courtesy." 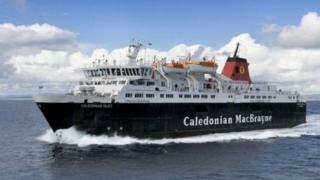 CalMac runs a fleet of 32 vessels across a network of 27 islands and mainland destinations on Scotland's west coast. Last year, it carried more than five million passengers and 1.2 million vehicles.